Nuclear Free Local Authorities (NFLA) is a local government group that has member Councils in England, Scotland, Wales, Northern Ireland and the Republic of Ireland. Since 1980, it has raised legitimate concerns and issues over all aspects of nuclear policy in order to assist local government in meeting its commitments to sustainable development, energy policy development, environmental protection and public safety. Further details on its remit and members can be found at it the NFLA website or by contacting the NFLA Secretariat using the web form on the website. NFLA is a member of the International Campaign to Abolish Nuclear Weapons (ICAN) and works closely on nuclear weapons issues with the Mayors for Peace (see below). It holds informative seminars, produces original research and campaigns for a nuclear weapons free world. It also advocates the development of renewable and decentralised energy as a sustainable and clean alternative to fossil fuels of new nuclear reactors. NFLA needs your help in encouraging interested councillors to consider membership for their Local Authority and to support events and campaigns it organises. Find out if your Council is a member of the NFLA. If it is, find out from the Secretariat who its nominated councillor representative is and offer your group’s support to them. Invite them to speak at any events you are organising. If it is not, then seek to locate sympathetic councillors interested in the environmental, energy and peace agenda. Put them in touch with the NFLA Secretariat. Lobby them to join the NFLA. Encourage them to put forward resolutions to the Council to consider joining the NFLA. If there are local / national nuclear issues that you wish to raise with your Council also write to them – either the Leader and / or the Cabinet members for international, energy or environmental matters. Forward on any response you get to the NFLA Secretariat. Mayor for Peace is an international local government group which has now over 7,500 member councils in 160 countries, representing over a billion people worldwide. Created in 1982, they are led by the Mayors of Hiroshima and Nagasaki, the two cities who have witnessed the huge destructive power of nuclear weapons. Mayors for Peace campaigns for a nuclear weapons free and a more peaceful world. Mayors for Peace is currently recruiting Lead Cities to develop national / cross-national Chapters to promote its work at the local level. 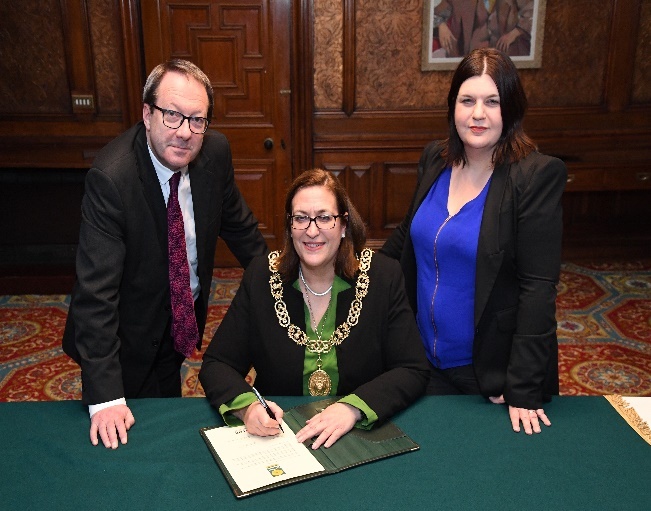 In the UK and Ireland, Manchester is a Vice President of Mayors for Peace and a Lead City for the Mayors, Provosts and Leaders for Peace Chapter. Most major cities are members, including the capital cities of the UK and Republic of Ireland, as well as of Wales, Scotland and Northern Ireland. The local Chapter is looking to support events which promote peace and international tolerance such as with Hiroshima & Nagasaki Days. Holocaust Memorial Day, World Refugee Day and International Peace Day. It also seeks to promote peace education at the local level and to cooperate on discussions around the UK’s nuclear weapon programme and the Republic of Ireland’s lead role in the creation of the International Nuclear Weapons Prohibition Treaty. A list of members in the UK and Ireland can be found on the Mayors for Peace website. 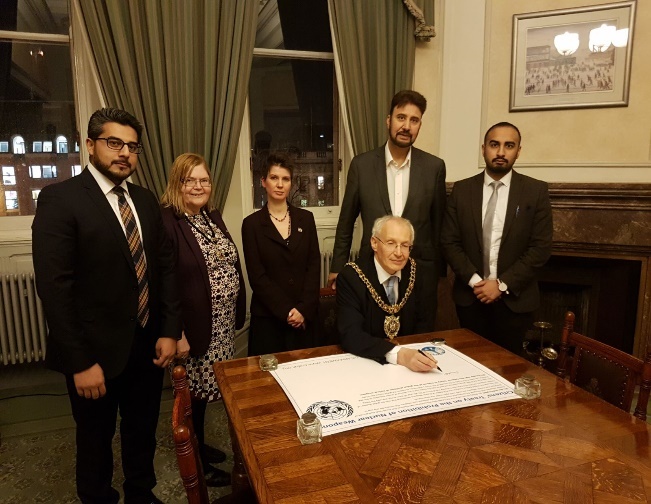 How you can help: Write to the Leader and Mayor / Provost of your Council requesting them to join Mayors for Peace and get in touch with its International Secretariat in Manchester and their local Secretariat in Manchester. Encourage the Council to join with your group to organise a special ceremony for the Hiroshima and Nagasaki anniversary on August 6th and 9th and / or to support an event for International Peace Day on September 21st. You can contact your local councillors by entering your postcode in the Write to them website. Point out to them that membership is free, though a small voluntary fee to the Manchester Secretariat will help in organising the work of the UK and Ireland Chapter. Point to the large membership of the Mayors for Peace and their aim to have 10,000 members by 2020. Mention that Mayors for Peace is a strategic partner with ICAN, the 2017 Nobel Peace Laureate. If they are not members, identify sympathetic councillors who will help to support Mayors for Peace and put a resolution of support through their Council. For further details on NFLA and Mayors for Peace ring the Secretariat on 0161 234 3244.